The much awaited 2019 World cup schedule finally released officially. Hosts, England will be taking on South Africa on the opening game at Oval stadium on May 20, 2019. In total, 10 teams are going to appear in the World cup 2019 and the series will be played in 11 locations in England. “It’s always an exciting moment ahead of any major event to announce the schedule and for the ICC Cricket World Cup. Next summer, fans around the world will be treated to compelling and competitive cricket as the best teams in the world go head to head in this round robin format for the right to be crowned world champions. “This schedule also gives fans across England and Wales the opportunity to watch world-class cricket on their doorstep with all teams moving around the country. We know from previous ICC events that every country will be proudly supported at each of the venues creating an exceptional atmosphere and a real celebration of the game.” ICC Chief executive David Richerdson said addressing media conference today. One of the title favourite, Team India will start the tournament with match against South Africa on June 5th 2019 at Southampton ground. the most awaiting match comes next where Bleed Blue with fight against their Arc rivals Pakistan on June 16th. 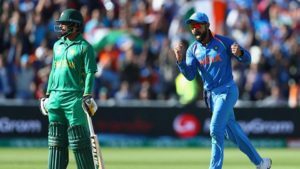 Interesting Fact: Pakistan never won a single match against India in World cups till date. Next Can Mumbai Indians Qualify for Playoffs?